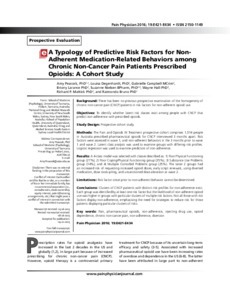 Background: There has been no previous prospective examination of the homogeneity of chronic non-cancer pain (CNCP) patients in risk factors for non-adherent opioid use. Objectives: To identify whether latent risk classes exist among people with CNCP that predict non-adherence with prescribed opioids. Methods: The Pain and Opioids IN Treatment prospective cohort comprises 1,514 people in Australia prescribed pharmaceutical opioids for CNCP interviewed 3 months apart. Risk factors were assessed in wave 1, and non-adherent behaviors in the 3 months prior to wave 1 and wave 2. Latent class analysis was used to examine groups with differing risk profiles. Logistic regression was used to examine predictors of non-adherence. Results: A 4-class model was selected with classes described as: 1) Poor Physical Functioning group (27%); 2) Poor Coping/Physical Functioning group (35%); 3) Substance Use Problems group (14%); and 4) Multiple Comorbid Problems group (25%). The latter 2 groups had an increased risk of requesting increased opioid doses, early script renewals, using diverted medication, dose stock-piling, and unsanctioned dose alteration at wave 2. Limitations: Risk factor onset prior to non-adherent behavior cannot be determined. Conclusions: Clusters of CNCP patients with distinct risk profiles for non-adherence exist. Each group was identified by at least one risk factor but the likelihood of non-adherent opioid use was higher in groups with particular clusters of multiple risk factors. Not all those with risk factors display non-adherence, emphasising the need for strategies to reduce risk for those patients displaying particular clusters of risks.